Raise your company’s profile by getting your logo printed onto your workwear. Printing your logo onto your t-shirts, polo shirts, sweatshirts, jackets, overalls and hats will increase awareness of your brand identity. Your customers and clients will know you they’re dealing with straight away, and with our custom heat seal transfer printing, you can get great results that are colourful and long lasting. Your logo is your most memorable asset - print it on your work uniforms and let everyone know who you are. We specialise in all kinds of clothing for work - from uniforms for hospitality work to heavy duty work gear for construction work. We know our stuff when it comes to quality workwear, and we stock a range of great brands like Fruit of the Loom, Uneek, Dickies, Portwest and Premier. Companies like these produce good quality, long lasting work clothes that can stand up to whatever your throw at them. Our logo printing service offers a high quality finish that will also last the lifetime of your item. Livingston is a thriving shopping destination in West Lothian. Technology companies and factories, along with the NHS’ St John’s Hospital and large retail centres, create a need for reliable printed workwear in Livingston. Locals and visitors enjoy shopping trips, days out and cultural events in Livingston. We provide printed workwear and a range of PPE in Livingston and will deliver your products to your doorstep. Delivery to any Livingston area is free of charge for orders over £150. Buy work gear with your name on it in Livingston. 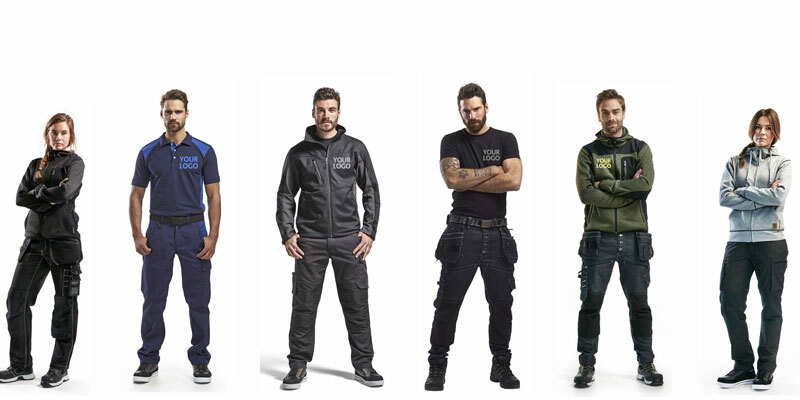 We’ve got a full range of workwear items for your company or sports team. You can specify the exact colours, design and logo size and placement that you want for your work uniforms or sports strips. The heat seal transfer process we use to print your logo onto your work clothes keeps it looking colourful and eye catching indoors or outdoors. Feel pride in your team kit whether you’re shooting goals or serving customers. Clients and customers notice details such as staff who are helpful and knowledgeable and work uniforms that are smart and display your branding in bright and clear colours. Printing your logo onto your work apparel also helps your team to bond and create a collective identity. Personalise your work uniforms or sports kits with a printed logo - we can carry out the heat seal transfer process on a range of items, including industrial workwear like hard hats and hi vis safety jackets. Get your free printed workwear quote today.